Anyway, enough talk and let’s RUN ‘EM DOWN! 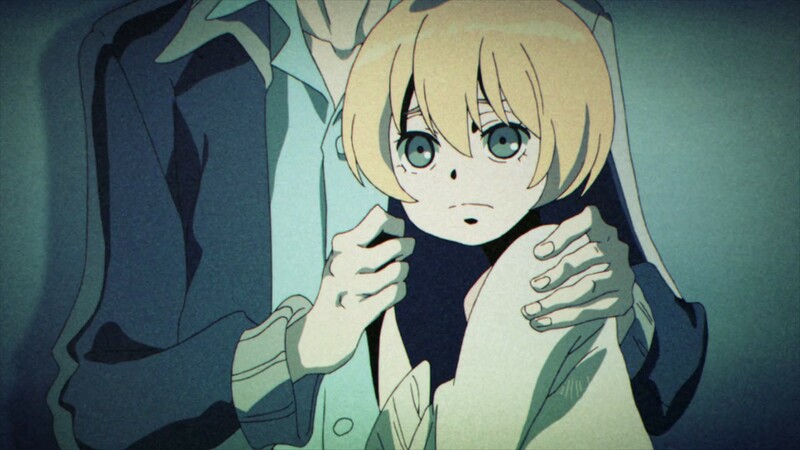 So I recently read from an article by Elizabeth up at Little Anime Blog that this show has been under some hot water for its supposedly “extreme” depictions of adolescent sexuality. That in itself is a given, but I think the bigger pill for Japanese broadcast oversight committees to swallow is its themes on homosexuality. As I’ve mentioned a couple times back in my weekly thoughts on Yuri on Ice, the Japanese aren’t exactly that open about homosexuality, despite many signs pointing towards their widespread appeal in the doujinshi community. In fact this sort of homophobia is less a “controversy” than it is a topic that most people in Japan just don’t want to talk about, and the most generic form of “groupthink” as far as this topic goes is the idea that homosexuality is abnormal; hence why they utilize gay comedians as a sort of foil character in many a Manzai skit. But that isn’t to say that things aren’t changing — they are, rest assured — but it is, for fear of a better phrase, an uphill battle. But hey, we’re supposed to be talking about what happened this week. Suffice it to know that Scum’s Wish continues to be as compelling with its themes, now delving into the downward spiral of self-destructive behavior characteristic of a lost adolescent. This show seems to be performing the very tricky task of defining aberrant social behavior whilst trying to avoid coming off as either patronizing or overly vindicating. In the case of the former, this means it has to avoid trying to oversimplify the complex nature of Hanabi’s deep-seated emotional attachment to her guardian-turned-love interest, and how this relates to her own perception of emptiness. 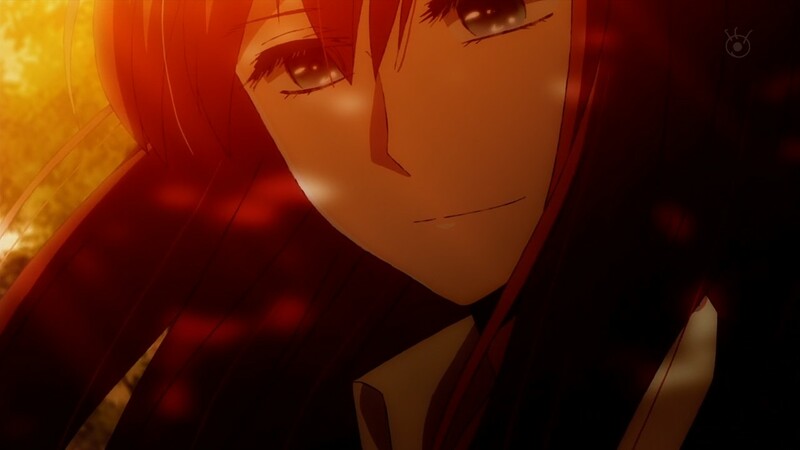 In an attempt to regain even a sliver of her own self-worth, she turns towards what she believes is the mindset that allows Akane to overcome this need for a man to define her worth. And by “beating her at her own game”, Hanabi projects her own values being more worthy than that of Akane. This is a sound, yet tricky argument that pushes the sensibilities of blind adolescent passion whilst remaining respectful to Hanabi as a woman in charge of her destiny. But at the same time the show is not painting her mindset as anything noble. If anything, the name of this show makes it very clear that this is a show about terrible people doing terrible things because of a similarly terrible emotion called “love”. And it’s when love turns people in to scum that we start to question our own perceived notions of the emotion in its most raw and tangible form. And yes, I’ve said it time and again, this show does an excellent job at maintaining that balance that keeps the story and its characters reasonable, and yet avoids any unnecessary patronization or vilification of its characters. The only one left to judge is us, the watcher — but at the same time, I can’t help but feel that the show is challenging me, the viewer, and my own views with regard to the topics it expresses. This is one complex show — and one that has definitely won me over consistently these past six weeks. One of the things I love about ACCA is that it takes us to a new place every week; each new place Jean visits is always a radically different world with its own unique culture. So if we step back for a moment from the whole plot and just examine what sort of exercise this show is trying to, it’s obviously trying to paint a picture of not just a country, but an entire WORLD under the premise of a “unified peace”. We’ve seen these sort of setups before, but in not-so-subtle representations, a.k.a. the “dystopian” universes. And the world of ACCA isn’t too far off from a dystopia when you think about it. Quite like the worlds visited by Lemuel Gulliver in the novel Gulliver’s Travels, each individual city-state seems to own a certain chip on the dystopian board game of monopoly, each with their own physical representations of political, environmental, and even technological issues that beset them, individually. So when we tag along Jean’s visits to audit each of these “worlds”, it isn’t all that different from Gulliver visiting the islands of Brobdingnag or Liliput, for example. And I think I mentioned a while back how I had that same feeling whenever Jean went to a new, exotic location that was radically different from his own. And perhaps this is what makes this show fascinating given we experience this world from the eyes of its observer, Jean. And the stakes go up when Jean gets thrown into the political machinations of a subversive plot to which he has nothing to do with. And whatever trepidation he is only beginning to feel in light of learning Grossular had someone investigate him only highlights his own naïveté regarding the complexity of the ACCA system. It’s an attitude that is quite different from other protagonists from dystopian stories, like Winston Smith from 1984 whose trepidation is on display as early as the first chapter. And I think this sort of approach has something to say about our own personal opinions regarding socio-political issues worth discussing. If the recent actions of President Trump are any indication, the wide-spread complacency and resignation of it being “the new normal” is something to be worried about. And I’m quite guilty of this attitude of resignation — I’m not trying to be a saint here — but I know that other people have been quite vocal about it. But my point is that Jean seems to call out to me as a character I resonate with in that he is clueless as to how important he is as a member of the society he is a part of. His slow progression towards realizing the need to put in an active effort into responding to socio-political injustice — and not the passive bulls**t he’s been doing in earlier episodes — speaks mountains towards people like me who find it so much easier to throw in the towel and resign myself to the “new normal” of a President that threatens the peace I have so long believed in as a member of a unified state. So if anything, ACCA has a very subtle message that resonates quite strongly with the people who watch it. It’s something very unique to its production as a whole, and its use of Jean as the embodiment of this message serves as an urgent, yet earnest appeal for us to become active seekers of truth and justice — all for the sake of upholding “peace” in a dystopian world. We get a little more focus this week on the motivations of Akko, but at the same time we get to see her childish ambitions tempered down a bit with the realization of pretty much what we’ve all come to expect in coming-of-age/underdog stories like this: that success requires diligence and hard work. Simply wishing to become a powerful witch (in the literal sense, as far as this show is concerned) is not enough; there needs to be a transformative process that can only be experienced through toil and hardship. Yes, we’ve heard this time and time again, but perhaps what makes this rudimentary lesson a bit more satisfying was the inclusion of Andrew, the haughty son of a Viscount and patron of the Witch Academy. And this brings us back to the whole theme of modernity challenging the relevance of magic in an age of technology. But this theme was done a bit more justice this week with what little bit of exchange Akko had with Andrew. It wasn’t what I’d call substantial, but the underlying thread is pretty easy to digest because it’s something we’re already familiar with. 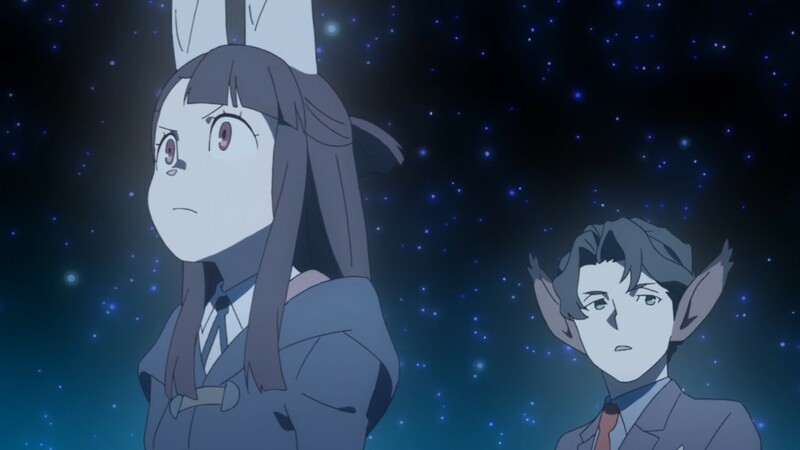 If anything, Little Witch Academia is quite aware that it’s tugging on the heartstrings of fans due to their attachment to the underdog, and the use of magic as a callback to tradition and nostalgia makes it the obvious candidate in this situation. But it’s not that we appreciate the classics or traditions (i.e. magic) out of sheer attachment. If anything, Akko’s earnest desire to become a witch speaks more towards a sense of hope that is seriously lacking in a modern age that is full of discouragement via the populist belief. We saw this in Episode 4 when Lotte defended a battered Annabelle from the torment of online trolls, and we see it again now when Akko’s own dreams are challenged by the calloused Andrew. So yeah, it’s nice to see that Little Witch Academia has a clear grasp on the thematic truths it wishes to portray. It’s a very classic story that may be dismissed as “the same moral in a different skin” — but that’s pretty much every story out there, really. For this show, at least, it’s doing an excellent job of enshrining hope in a young girl that wants to be a witch. It’s something that everyone around her is telling her she can’t do; but I’ll be damned if her persistence and determination to succeed despite the noise in the gallery is something that isn’t endearing. That’s the reason why we love stories about the underdog; we love it when they prove everyone wrong. And yes, I can’t wait for the day when Akko eventually proves everyone wrong. Because her victory, surely, will be ours as well. I think it’d be an understatement to say that this show confuses the heck out of me. Although I applaud the show for its somewhat insightful depictions of life that are worth looking into through its characters, I still can’t figure out what this show is trying to achieve. And asking that from a slice-of-life show might be asking for too much, but it’s more an issue of the randomness of the comedy creating similarly random situations that fragments the show’s thematic cohesion. The themes are justifiably good, take note — they’re just all over the place. Like in the first segment of this week’s episode, we look at Saikawa and Kanna’s relationship, and how in some ways it’s perceived as a yuri pairing. But look beyond the obvious shipping and there’s an innocence to Saikawa’s emotional attachment to Kanna that actually makes her quite endearing. There’s no reason for young children to be force-fed concepts of gender roles at a tender age, and Saikawa’s infatuation could well be her manifestation of genuine friendship. She’s originally portrayed as the aloof classroom know-it-all of sorts — that kid who just tries to 1-up everybody whenever they have the chance — and so it’s not that hard to deduce (from what limited interactions we’ve had with Saikawa) that she doesn’t really have any “real” friends. 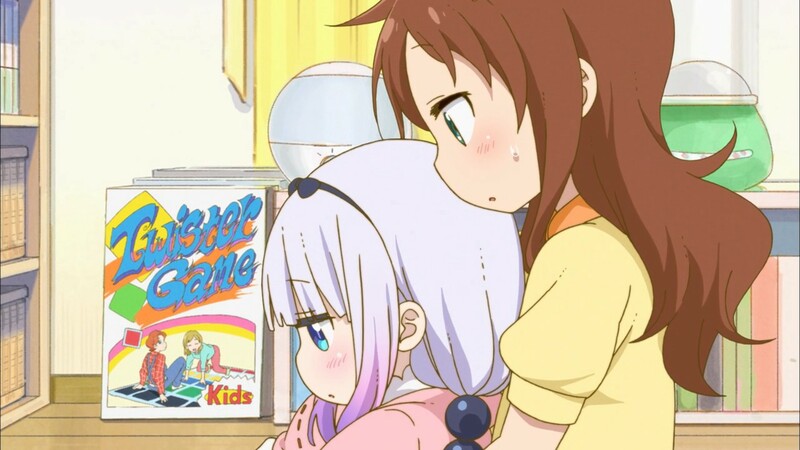 Seeing her so attached to Kanna, therefore, is less self-gratifying to the viewer than it is, really, rewarding. Granted there are some suggestive themes in having to use Twister as the “bonding” game between the two, I chalk that up to innocent banter. Regardless, there’s merit into not interpreting Saikawa’s interactions with Kanna as overtly sexualized, namely that children should be free from an environment that insists on stereotypical gender roles, but still be guided in the expression of their emotions, such that they can become the best person they can become. Saikawa, I hope, can learn to use her emotions towards Kanna in a positive manner. But the second segment moves to a rather (painful) depiction of what is basically Shotacon fan service, before moving on to a third segment that looks at Fafnir and his appraisal of Takiya the Otaku. It was a rather touching segment that adds a little softness to Fafnir’s rough exterior, and was a nice way to round up the episode. So all-in-all, this show is literally all over the place. Again, I don’t see where any of this is going, and I’m not sure if I’m supposed to expect it to go anywhere to begin with. But its incessant need to return to an underlying story involving Dragons vs. Humans in the dragon realm just begs for something a bit more plot-oriented. Will we see that come the second half of the season? Who knows, really. But let’s just say I’ll be entering it with a heavily tempered stance. For some reason, this episode decided to focus on the psedo-adventures of Satania and how everyone just basically makes fun of her. It’s kinda tiring to have to see the same schtick over and over again for an entire episode. And even though they did a little role reversal with Satania getting the better of the class rep character, the general flow of the gag segments fell well within — wait for it — predictable and uninspired. I just feel there is so much more that can be explored with these characters than is already being done. Heck, some of the jokes are pretty funny when I think about it, like the silly Setsubun gag I mentioned in my last Lost in Translation post. But even these sort of funny jokes are a dime a dozen in this show. It’s like I have to trudge through 10 minutes of pretty much “meh” before arriving at a gem of a joke. And that’s something really tedious to have to go through, and is probably not really worth my time if this show keeps this sort of inconsistency. I’m giving it one more week to prove me wrong — otherwise, I’m really gonna have to drop it (pun not intended). Did I say short? Well, oops. Anyway, this was a pretty intense week coming from the major shows in this list. So hopefully, I can bring up a mid-season rundown within the next few days. Pray I’ll still be alive by then, haha! Until next time, ciao! Oh dear, I spelled your name wrong. D: Sorry!